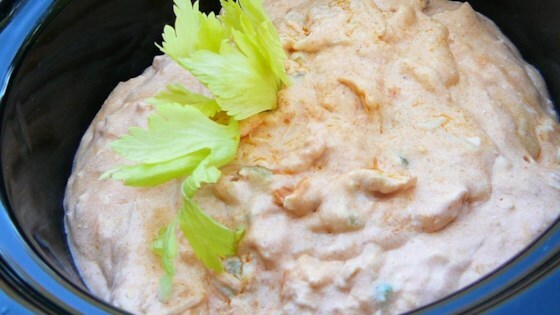 "This is a creamy, hearty dip that works well for a gathering. It's not light, and is a good option when you are serving close to meal time, but don't want to prepare a full meal. I serve this with multigrain tortilla scoops." Mix cream cheese, chicken, buffalo wing sauce, ranch dressing, and sour cream together in a large bowl; transfer to a 9x13-inch baking dish. Evenly sprinkle Colby-Monterey Jack cheese over dip. Bake in the preheated oven until cheese is melted and lightly browned, 25 to 30 minutes. Serve with tortilla chips. You can safely cut the buffalo sauce to 1/4 cup to maintain flavor but make it more mild if your audience does not like spicy food. If you don't want to add sour cream just replace with ranch dressing. Another variation for true hot wing fans would be to substitute the ranch dressing for blue cheese dressing. My husband and I absolutely love this recipe!! We love making it for all our get together s. Even occasionally eat it for dinner!!! I use taco seasoning instead of hot sauce. I don't eat spicy foods, very good dip! I use sharp and medium cheddar cheese.